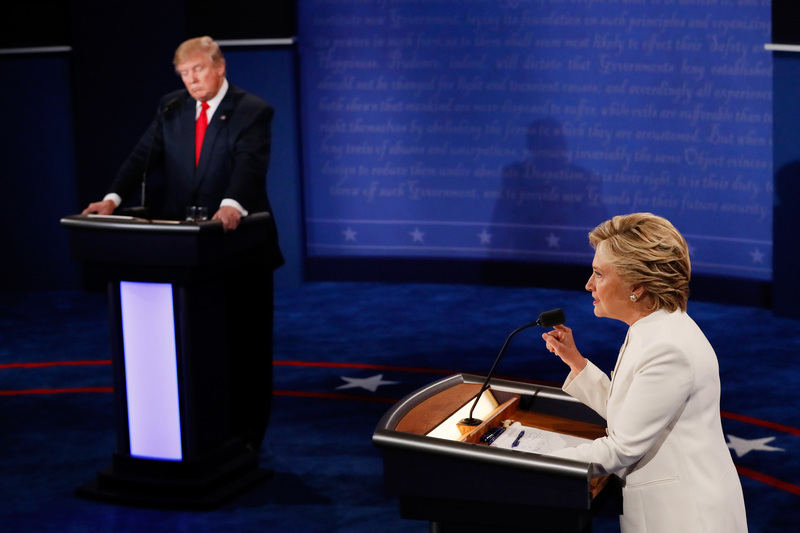 Near the beginning of a debate that was overshadowed by Donald Trump denying the democratic process and calling Hillary Clinton nasty names, there was actually some discussion of policy. Moderator Chris Wallace started off the matchup with a question about the Supreme Court, and used that as a segue to ask the two about their opinions about Roe v. Wade and reproductive rights during the presidential debate. As he did with many of the policy questions, this discussion featured Trump speaking a few words that made sense, others that exaggerated the facts with hyperbolic scaremongering, and a reversal of a previously held position. But in the midst of the back and forth he held with his more sober-minded opponent, I found myself turning to my roommate and saying, "Is it just me, or is this a really good debate about abortion?" Before the debate, I wrote about my frustration that abortion, like gay rights, climate change, education, and mass incarceration, would be almost completely ignored by the presidential debates. I am happy to see I was wrong. Because Clinton gave a response to Trump's attacks on abortion rights that framed the issue in terms that reflect the fights currently happening in this country over choice. Clinton's answer included two issues that are at the forefront of the debate right now. "So many states are putting very stringent regulations on women that block them from exercising that choice," she said, referring to laws like those in Texas that were struck down by the Supreme Court for placing undue burdens on women seeking abortions. She discussed her feelings on Roe, saying, "There can be regulations on abortion so long as the life and health of the mother are taken into account." It was this standard that the Supreme Court used in striking down Texas' laws, saying that the laws' claims of protecting women's health were bogus. She affirmed her support for Planned Parenthood in the debate as well. "They are defunding Planned Parenthood, which of course, provides all kinds of cancer screenings and other benefits for women in our country," she said. She's right — 10 states have stopped Planned Parenthood from receiving Medicaid funds even for women's health care not related to abortion. Congress tried to do the same. It's the kind of spirited defense of the organization that has been often missing from an election that previously belittled the need for women's health care. When Trump attacked Clinton on the issue of partial birth abortion, she responded with a nuance that cut through the sensationalist rhetoric Trump used. "This is one of the worst possible choices that any woman and her family has to make." The abortion conversation reminded us why it matters that we're probably about to have a female president. When she talks about women's health, she's not coming from it as an outsider. This is the woman who proclaimed in 1995, "Human rights are women’s rights, and women’s rights are human rights," and this is the woman that Planned Parenthood said has "the strongest record on reproductive rights ... in American history." At Wednesday night's debate, she proved it.